Sensory features in autism - I am interested in discovering how atypical responses to daily sensory stimuli by individuals with autism impact on their ability to complete day-to-day tasks and manage their emotions. I am trying to link the behaviours that parents, therapists and teachers see in their children with specific brain profiles using neuroimaging. This will help us design new therapies to better address these difficulties for individuals with autism and their caregivers. Early diagnosis of autism - I am investigating the possibility that atypical responses to sensory stimuli in infancy may be one of the earliest signs of autism. This may help us develop a tool that will identify autism earlier and allow us to involve children in earlier intervention that has been shown to be most effective. We are examining sensory signs in babies with risk factors for autism e.g. premature infants, babies with developmental delay and following them to 12 months of age to test for autism symptoms. Sensory subtypes - My work has established that there are distinct patterns (or subtypes) of responses to daily sensory stimuli in children with autism. We think that children with autism differ in the intensity with which they respond to sensation and in how they can integrate the many sensory stimuli they are exposed to in daily life. By classifying the type of sensory difficulty experienced by the child with autism, we can provide more customised therapies. Custom interventions - I am beginning to explore which children with autism will respond best to specific interventions based on their sensory subtype. There are many interventions available for children with autism but it is hard for caregivers to know which ones are likely to be effective for their child. We believe that understanding the child’s sensory subtype will allow us to predict which types of interventions are likely to be successful. In a world-first study, we are testing this theory in a project funded by the Gastronomic Lunch of the Year. Children with autism will be invited to participate in a self-regulation intervention and we will compare the differences in their outcomes based on their sensory subtype. I was drawn to research after practicing in paediatric occupational therapy for over 10 years. I found that my clinical practice was constrained by the lack of research underpinning many of our key interventions. I wanted to be able to provide better answers to the questions that families were asking me, and more effective interventions for the children I was helping. Individuals with autism and their families face many day-to-day challenges. My work seeks to unlock solutions to some of the most demanding issues for these individuals. By intervening earlier with the right intervention, I hope to be able to increase opportunities for individuals with autism to participate fully in daily life and reduce the burden on their caregivers. Associate Professor Alison Lane’s research focus is on the sensory features of Autism Spectrum Disorder. Sensory features are atypical responses to daily sensory stimuli that result in difficulties participating fully in daily life. For example, sensory features can include becoming distressed when hearing a siren or vacuum cleaner turned on; becoming aggressive if someone accidentally brushes by you; failing to respond to a painful stimulus; or becoming overwhelmed in the classroom due to the many sound, visual and movement stimuli involved. The focus of Associate Professor Lane’s work has been to identify sensory subtypes or patterns in autism. She has found that not all children with autism experience that same types of sensory difficulties. She is applying these findings to brain imaging studies to see if different sensory subtypes are associated with different brain profiles. 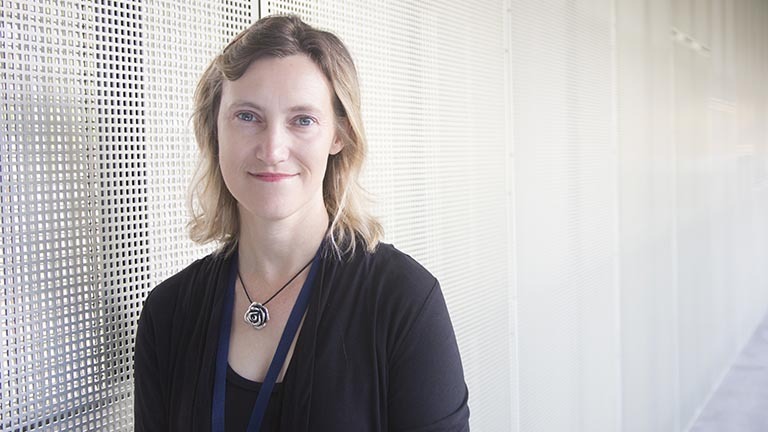 Associate Professor Lane is also examining sensory development in the first year of life in babies with risk factors for autism to see if sensory features can help identify autism earlier in life. She is also exploring the effectiveness of interventions for autism for children in different sensory subtypes, proposing that understanding the child’s sensory subtype may help clinicians to customise intervention for each child thereby resulting in more positive outcome for the child and their family. Associate Professor Lane’s research program will continue to seek to improve the lives of individuals with autism and their caregivers by discovering solutions to day to day challenges caused by sensory features.